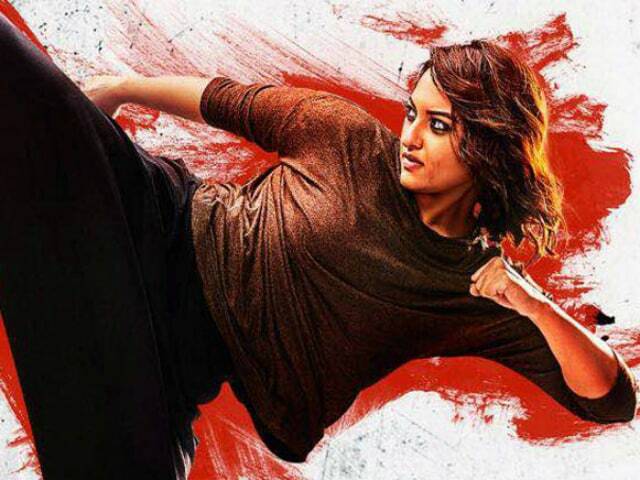 Sonakshi Sinha is an eye-catching action star and director-turned-actor Anurag Kashyap evil incarnate in A R Murugadoss' intriguingly titled Akira. Both pull off their roles with astonishing aplomb. The film as a whole is, however, patchy. Its facile genre sleights - rogue cops, wronged innocents and bloody confrontations - hit home only sporadically. Despite pitchforking a kickass female protagonist into the spotlight, and also writing an upright cop role for an actress (Konkona Sen Sharma), Akira does not seem as radical a commercial Hindi film as one might expect it to be. Hindi movie fans have seen action dramas aplenty about the police-underworld nexus. In Akira, a cynical segment of the police force is itself the underworld. But, for all its aggressive shots at trying to be different, the film plays out as no more than a crime drama in which an aggrieved protagonist fights tooth and nail against forces that might get away with murder if the former does not intervene. There is obviously no suggestion in the screenplay that the heroine's deaf-mute father (Atul Kulkarni in a special appearance) was ever a Kurosawa fan. Nor does the director's approach to the supercharged crime drama reveal any stylistic traits that might please those that have been weaned on the Japanese cinema legend's timeless masterpieces. To put all speculation at rest, the film informs the audience right at the outset that Akira is a Sanskrit world that means "graceful strength". It then proceeds to spell out exactly who embodies it. The heroine of the film is Akira Sharma (Sonakshi Sinha), a college student who is sucked into a violent conflict with four Mumbai policemen spearheaded by a vicious, cocaine-snorting assistant commissioner of police, Govind Rane (Anurag Kashyap). The latter have a lot to hide and they suspect that Akira is a woman who knows too much for their good. The four policemen put everything at stake to ensure that the girl isn't able to blow the lid off a crime that they committed in broad daylight. Akira, a loose reworking of the 2011 Tamil hit Mouna Guru - the story is credited to Santha Kumar, the director of the original film - opens with a police van zipping down a desolate highway. The vehicle stops off a clearing in the forest, and three youngsters, two boys and a girl, their hands tied behind their backs, are lined up like sitting ducks before a policeman's gun. One of the boys is shot dead. The film cuts to 14 years earlier to reveal flashes of the childhood of the girl whose life is on the line. As a schoolgirl in Jodhpur, Rajasthan, Akira identifies an acid attack perpetrator. Sometime later, her mastery over martial arts comes in handy. She not only thwarts an eve teaser, she accidentally disfigures his face with the very acid that he tries to hurl at her. Akira is taken away to a remand home for children. Misfortune follows her even after the move to Mumbai, where she runs into a snarky sister-in-law, a bully at the college and, of course, the quartet of cops who want to eliminate her. They succeed in packing her off to a mental asylum where the presiding psychiatrist declares her insane. But Akira is obviously no pushover. The film is replete with action sequences in which the heroine has a go at groups of men double her size and comes up trumps. Several women, including the ACP's mistress, are subjected to extreme indignity and violence in the course of the film. So, Akira also has a heavily pregnant policewoman Rabiya Sultan (Konkona Sen Sharma), who steadfastly follows the leads that could bring the wrongdoers to book. While she treads the path of law, Akira is left to resort to her own rough and ready methods in the fight for justice. It is all rather contrived. Akira is a natural do-gooder who happily lends a helping hand to those that need it. In one scene, she is invited by the college principal to deliver a speech. A group of trouble-makers among the students mess up the sound system. Undeterred, Akira alights from the stage and addresses a group of deaf-mute school students with the help of sign language. Akira is no breakthrough for women power in Hindi cinema. The heroine is actually only a female version of the swaggering supermen played on the big screen by the likes of Salman Khan and Akshay Kumar. She might be far daintier and slighter built, but there is absolutely nothing that is beyond her. She suffers a lot on account of her courage, but her invincibility is never in doubt. And that robs the film of any real possibility of springing any real surprises. The film certainly has its moments, and Sonakshi does her career no harm by revealing a new facet of herself, but Akira isn't blockbuster material.